It was just last week that we reported on a previously undiscovered dwarf planet located in the inner Oort Cloud. Now, astronomers have detected two more previously unseen celestial bodies, including one that could be as much as 932 miles (1,500 km) in diameter. Fresh off the heels of VP113 (a.k.a. "Biden" — and let's hope to hell that stupid name doesn't stick), the same team of astronomers, Scott Sheppard and Chad Trujillo, have confirmed the discovery of 2013 FY27 and 2013 FZ27. This recent flurry of discoveries is not a coincidence as all three objects were found using images taken by the Dark Energy Camera on the Blanco telescope in Chile. Its hi-res camera features an impressive 570 megapixel capacity allowing it to pick up the faintest light from remote objects. NASA / JPL Small-body Database Browser. FY27 is now the ninth brightest known object (a 3.0 magnitude) beyond Neptune (after Eris, Pluto, Makemake, Haumea, Sedna, 2007 OR10, Orcus, and Quaoar, in that order). Its size, which could be anywhere from 472 to 932 miles (760 to 1,500 km), qualifies it as a dwarf, or minor, planet (the best estimate right now is an object about 620 miles (1,000 km) in diameter). FY27 is currently about 80 AU from the sun, similar to VP113's current distance. Remember, what made VP113 unusual wasn't its current distance from the Sun; it was the shape of VP113's orbit and the fact that it never gets closer than about 80 AU from the Sun. A lot of people are getting confused about this, reporting VP113 as the most distant object in the solar system. It isn't; Eris is farther away, and so is Sedna, and so are both Voyagers, and so are known long-period comets (though we can't currently observe those). Both VP113 and FY27 are currently about 80 AU from the Sun, but unlike VP113, the new FY27 is near its aphelion, almost as far away as it ever gets. Over time, FY27's orbit will bring it much closer, to Neptune's neighborhood. As such, while it's an unusually distant object among the things we currently know about, its orbit doesn't stretch the boundaries of our solar system the way VP113 did. Here's a view comparing VP113, FY27, the planets, Pluto, and Eris. FY27's orbit is not like Sedna's; it's more Eris-like. What makes FY27 special, to me, is its brightness, and implied size. It is almost certainly a round world, and it's a member of a size range of Kuiper belt objects that have really diverse surfaces, implying that each of these worlds has a unique story to tell, variations on themes of ices and organic gunks and transient atmospheres. (Read an article I wrote about Salacia for more about that.) I contacted Scott Sheppard to see if he could tell me anything more about it that wasn't in the MPEC, but there isn't a lot of information on FY27's nature yet. They don't know its color. Still: it's a new round world; it's not every day we add another one of those to our solar system. There's much more to Emily's interview with Scott, so be sure to check it out. As for the other proposed minor planet, FZ27, it's about 50 AU from the sun on the far edge of the Kuiper belt. It measures about 372 miles (600 km) wide, thus qualifying it for dwarf status (criteria for dwarf planet status can be found here). 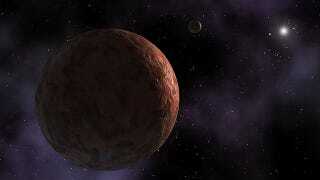 Top image: Artistic impression of Sedna via NASA.